“Sea Dunes”- A family-friendly house with an unobstructed Gulf view and 100 yards away from the beach. The open floor plan is centered around a large great room with vaulted ceilings. Fully-equipped kitchen with breakfast bar is adjacent to a dining area. Living area has a 55 "TV viewing area with Direct TV - WIFI available. 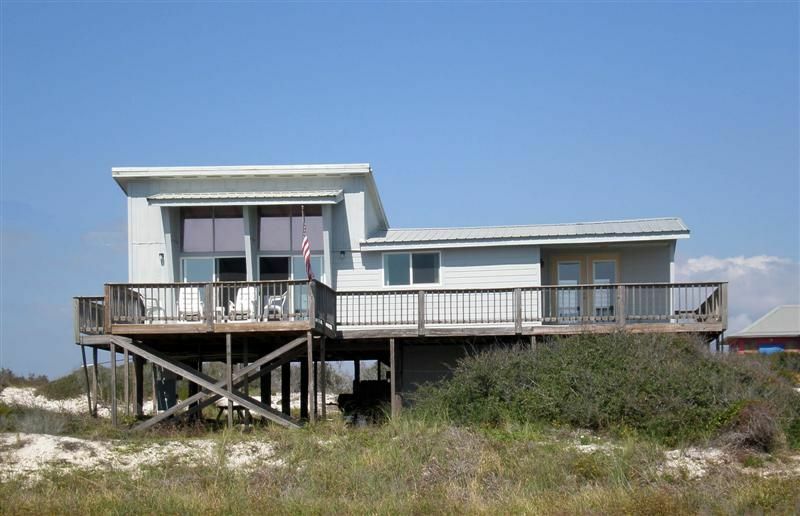 You can commune with nature by relaxing on the gulf side wrap around deck for plenty of sun, or sit on the covered deck overlooking the dunes. House has a separate laundry area combined with a half bath underneath. The enclosed outside shower has hot and cold water. Fishing table with large sink also located underneath the house with extra sitting in the shade. If you get the urge to explore, you can move your car from one of the houses’ 2 covered parking spots and take a short drive to the heart of Gulf Shores and local stores and restaurants. Sea Dunes guests can also enjoy a round of golf at the famous Kiva Dunes Golf Course, charter a boat at Fort Morgan Marina, play at the Gulf Shores amusement and water park, visit the nearby Civil War fort, or take a ferry boat ride across the bay to Dauphin Island. This well maintained house is located on Fort Morgan Peninsula. 1 bath upstairs with half-bath downstairs in laundry room, near fully enclosed outside shower with hot and cold water. outside fish cleaning table and sink. Activities:Charter a boat at Fort Morgan Marina. Golf - Kiva Dunes famous golf course along with many others. Shopping - Wholesale outlet in Foley, AL. Putt putt golf and race tracks. Area: 20 Minutes to the heart of Gulf Shores. We live in Atlanta, GA. We have enjoyed the house since we purchased it in 1984. Our 2 children, recently graduated from college, were born and raised going to the beach and still love it today. My wife and I have seen beaches all over the world and this place is still one of our favorites. We also purchased the house because it is away from the main part of Gulf Shores, but a short drive to all the main attractions. The house has great views of the water inside and out. The house is in a private subdivision with a private beach. the bath upstairs is a full bath with combo shower/tub. The bath downstairs is a half. there is a great outside shower fully enclosed. Enclosed 1/2 bath located in laundry room underneath the house. Private beach in our subdivision. Great open view directly in front of the house. Great views of the dunes in back of the house. Open wrap around deck in front with covered area off master bedroom, covered deck in back with picnic table. Parking slab under house with picnic table. long term rentals considered during winter months. June and July rentals by week only from Saturday to Saturday. The beach house was neat and clean. It was just the right size for two of us. It’s nice to sit on the deck and see the ocean. It’s just a short walk to the beach. Mike and Donna are great and always there to answer any questions. We will be back! Thanks so much for the great review! Always love having good people to enjoy our house. There is great golf all around the area. Kiva Dunes is just 1mile away. If you like civil war history, Fort Morgan is at the end of the peninsula and Fort Gaines is across the bay by a great ferry ride.